A Lovely Lark: Moving Up - It's Baaaaaaack! I'm so excited, I had to share - one of my favorite shows is back with a brand spankin' new season! The show in question? Moving Up with Doug Wilson! He follows three sets of homeowners who have 'moved up' into one another's homes. For example, Couple A moves into the house of Couple B, who moves into the house of Couple C. Here's the kicker - they all do huge remodels and the previous owners come back to see the results! Sometimes they are fabulous, other times they are bizarre, but it is always great entertainment. 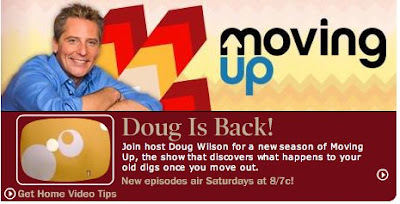 I love Doug's crazy quirkiness and I can't wait to watch tonight at 8/7c! So set your Tivo's and get ready for some truly entertaining reality television!